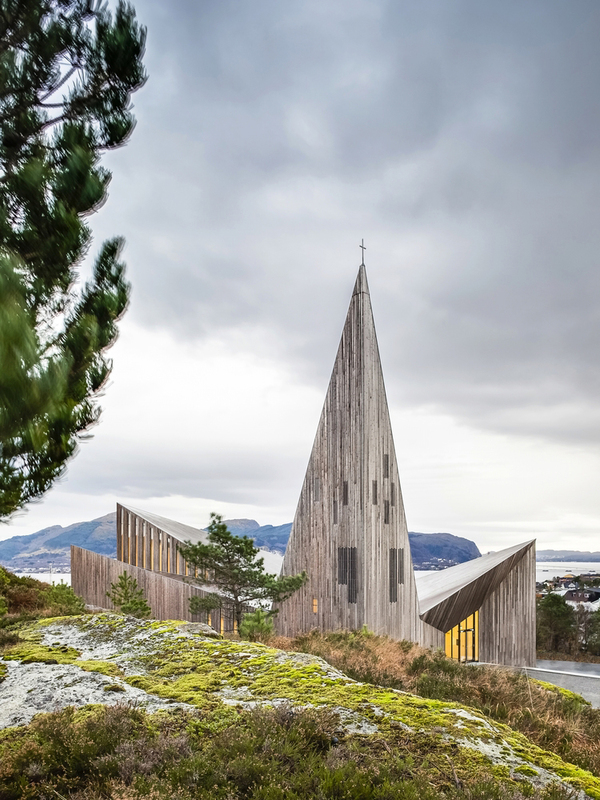 Snapshot: Norway’s Church of Knarvik, by indepedent Oslo-based architecture firm Reiulf Ramstad Arkitekter, homages the heritage of Scandinavian church design and enlarges the spectrum by serving as a community and cultural stronghold for the arts, as well as a house of worship. Scandinavia’s fjords, mountains, coasts, and plains form one the most beautiful topographical, vegetable, and spatial environments on the planet, and Oslo based independent firm Reiulf Ramstad Arkitekter is renowned for inserting simplistic geometrical architectural marvels into this Northern context in ways that pay tribute to the vibrant cultural framework. 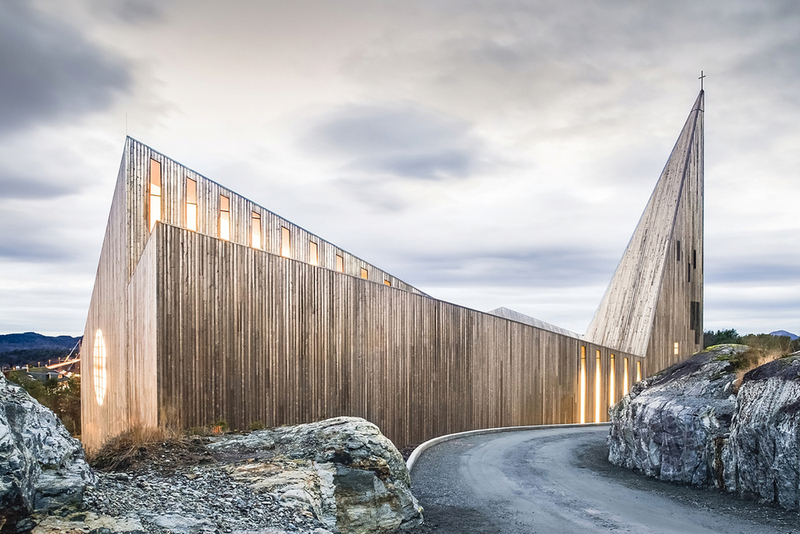 A key aspect of that cultural framework is its spiritual dimension, and Reiulf’s latest structure--the Church of Knarvik--augments the traditional sacral angles and dimensions of the continental cathedrals, and increases the buildings functional and aesthetic potential in very democratic and culturally relevant ways. Located at the intersection of four fjords, Knarvik is a large village in the Western section of Norway whose new Church of Knarvik grips the Norwegian landscape in a very organic manner, with angles ascending from the perimeter of the structure, then descending into the interior regions, before ascending a final (spectacular) time in the figure of the main spire. While in another structure(s), each of these separate wings might have formulated the entire geometric pattern for a single building, the Church of Knarvik essentially combines isolated geometric themes that seem to have been surgically removed from some other building in which they are fully fleshed out, and then curiously hybridized into this unique architectural design. A magnificent main gable, for instance, extends dramatically upward but ends in a sheer precipice, its other “phantom” side nowhere to be seen. This is a very modern take on a traditional style that plays with perception, but may also coincidentally underline the transcendence and etherealness that could be indirectly associated with a house of worship. 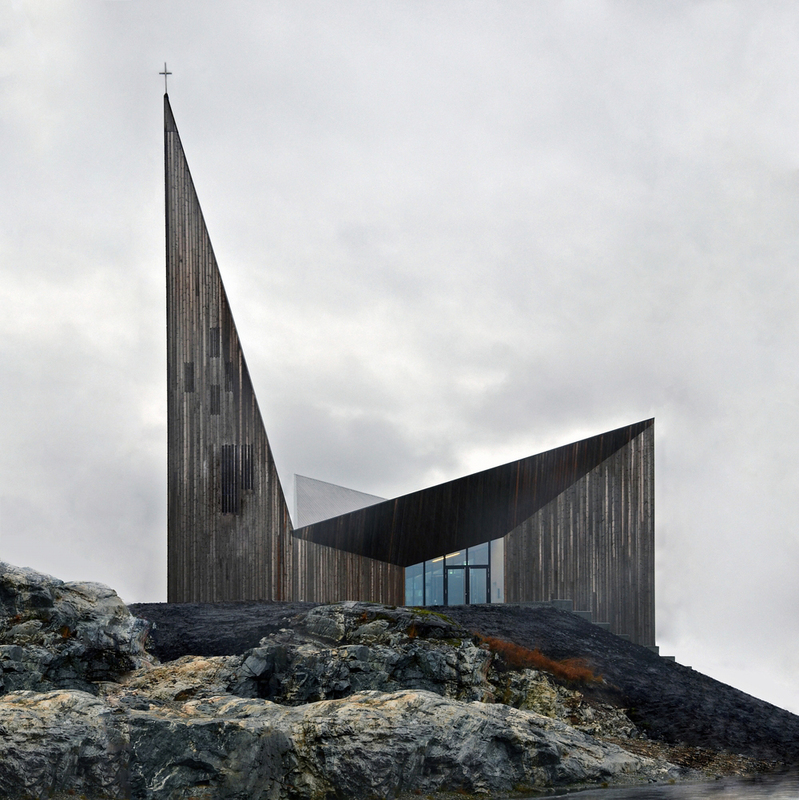 Perceptual innovation is not uncommon to Reiulf’s total design strategy for the Church of Knarvik, starting with the entrance: an incongruous polygonal indentation lying below-right of the steeple. In other places this type of augmented distortion takes a different shape, that of replacing traditional elements with a simulacrum that is more harmonious with the style Reiulf is aiming for; and so, a traditional, circular, illuminated stained glass window is replaced by an atypical, circular, suggestive work of a more modern artistic mentality, which is the slatted wooden piece on the opposite wing from the steeple that is brightly and artificially illuminated at dusk. Wood, as the uniform material for the exterior, invites a surprisingly wide array of design choices, as well as keeps things culturally relevant, as even a cursory google image search of Scandinavian churches shows that many of the traditional designs boast uniformly wooden exteriors. Many of those structures are tiered, multi-level gabled buildings that ascend a few stories in a pyramidal scheme and end in the highest point of the steeple. 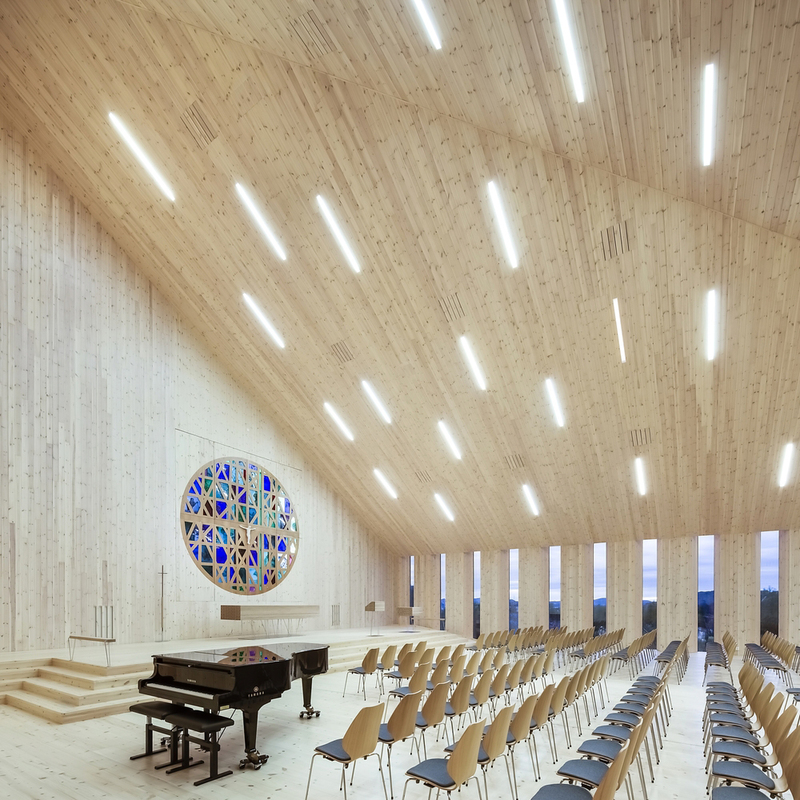 Reiulf cuts the fat away, keeping the raw angular features, but extending them dramatically this way and that, creating a multitude of large surface areas that are not seen in traditional Scandinavian church design. The design team is then free to do with these surfaces as it wishes, but ironically, the team uses this modern method to acknowledge the traditional north-south heavenward axis along which churches are normally arranged, but which here takes shape as slim, elongated windows lined up next to each other, and artistically disrupted here and there by a shorter iteration. The Sydney Opera House, or an urban performing arts center, are two building motifs that come to mind when taking in the Church of Knarvik. For example, while the staircase is an impressive feat of design, it isn’t executed according to its common templar foundation of arising uniformly to the church entrance, but rather, it approaches from the side, as if the church were a monastery lying just off a steep Himalayan path; or a modern library; or a music venue. This ties in which the community aspect that Reiulf has emphasized for this project, namely the intent to make the church a platform for community development in general, from the arts to music. The stairway ascends to a large patio in front of the entrance, forming an ample meeting place, and will serve as the community center at some point in the future. The Church of Knarvik is never entirely divorced from its traditional architectural lineage, artifacts of which dot the dramatic Scandinavian landscape, and one of its many lasting appeals will be its implementation of that heritage with a larger scaled culturally comprehensive design that invites a variety of uses, which makes the church the spiritual heart of the community of this Norwegian village.